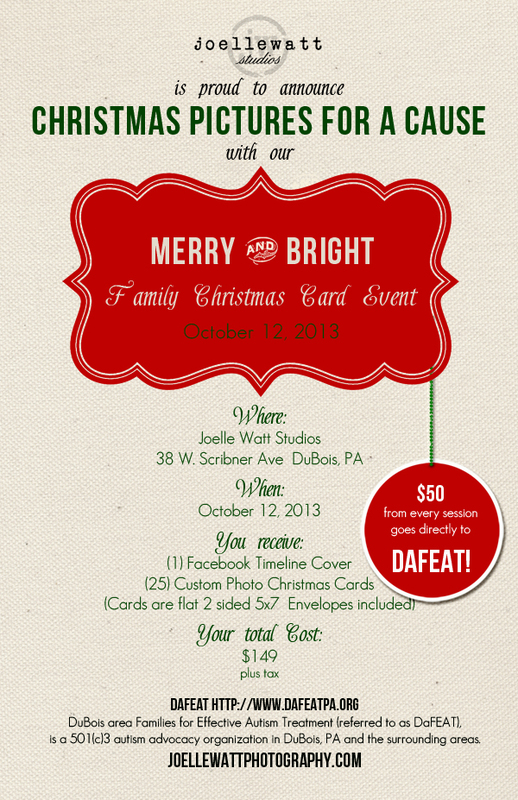 christmas pictures for a cause...book early! we are SOOO excited to collaborate withDaFeat (DuBois area Families for Effective Autism Treatment) this year for our christmas card shoot!!! MARK YOUR CALENDARS and BOOK ASAP!!! local artist, brenda kellar is one of the most talented, creative people on the planet! she will be designing not one, but TWO custom photo set-ups for the shoot to contribute to this wonderful cause. $50 from every session goes directly to DaFeat AND you receive 25 custom photo christmas cards as well as your personalized facebook timeline cover. you'll view your images right at your session, place your order, and your cards will be ready to pick up right BEFORE THANKSGIVING! BAM! get your cards checked off your list early!